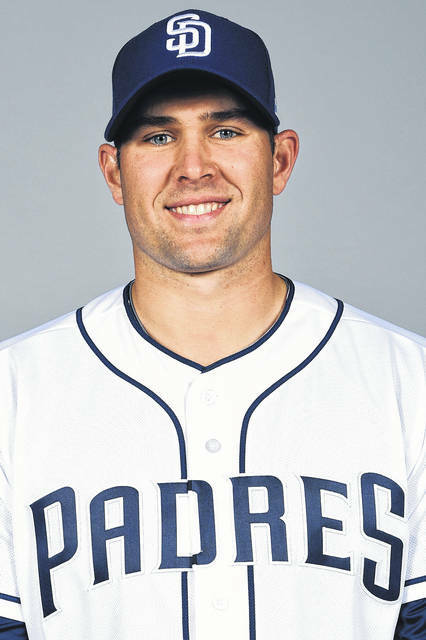 Editor’s note: This is the second of a two-part story on North Star native and Versailles High School graduate Craig Stammen, who is a Major League Baseball pitcher with the San Diego Padres. Part one appeared in Tuesday’s edition of The Daily Advocate. You can read the entire article on our website at www.DailyAdvocate.com. CINCINNATI – Craig Stammen is in his ninth year as a Major League Baseball player. The North Star native and Versailles High School graduate is currently in the first year of a two-year contract with the San Diego Padres and they were in Cincinnati this past weekend for a four-game series with the Reds. Stammen appeared in Thursday night’s 6-2 win over the Reds. He pitched one inning facing three batters with 0 runs, 0 hits, 0 walks and 0 strikeouts. On Sunday, the 34-year-old Stammen again pitched one inning facing four batters. He allowed one hit, but struck out two batters and earned the win for the Padres improving his W-L record to 7-2 this season with a 2.57 ERA. As of the end of of Sunday’s game, Stammen has appeared in 64 games this season with 70 innings pitched and 77 strikeouts. This reporter caught up with Stammen prior to Saturday’s game at Great American Ball Park which ended in a rain-shortened 7-2 win by Cincinnati. How was that day when you got drafted? I was playing a college summer ball game for the Grand Lake Mariners. I was going to play for them in case the draft didn’t go well and I needed a place to play during the summer. First game of the year and I remember asking the coach, Coach Stafford, he is pitching coach at Ohio State now, and I said hey can I keep my cellphone on me during batting practice because you know it is about the time I might get drafted. He said yeah sure don’t worry about it and then like five seconds later I got the call. I got drafted by the Nationals in the 12th round. I called home and made all those call because I knew I wasn’t going to be playing anymore games for the Mariners, but I stayed for the game. My grandparents showed up and for whatever reason they found Washington Nationals hats in the Greenville Walmart. Like 12 of them. The only time Greenville Walmart has sold Washington Nationals hats and we bought them all. So they show up at the game with all those hats and I am like how in the heck did they get these hats already. Apparently Greenville Walmart knew what was going on and took care of it, so they showed up and we had a cake and that night we celebrated,took some pictures and it was a pretty neat day. A day I will never forget. How has playing in the minors with several different teams and being brought up and down in the majors a few times impacted your career? I’ll tell you what if I hadn’t been playing baseball I probably would have never left small town Ohio, but I’ve got to experience a lot of different things and have lived in San Diego the last two years. I get to see all the different cities in the United States and meet all kinds of different people from different places in the world and I think I have a better perspective on the world as a whole than I would have if I had just stayed home and lived my comfortable life and done what everybody else does.The life experiences that I have had that I will be able to take home when I am done playing I can share with everybody else and try to build a strong community. I’m sure there were tough times though? Oh yeah. I mean there is always ups and downs in baseball . There’s times when you struggle and there’s times when you are playing really well and not get the opportunity to advance and there is times when you have injuries and you have to fight back from them and persevere. Any time any of those setbacks happen it’s always been a set up for a nice little comeback. I just want to try and keep that mantra going and hopefully other people pay attention and know that even when things go bad the best is yet to come and there is something to always look forward to. What are your plans after your playing career is over? That’sa good question. I’ve built a house back home in North Star,so the plan is to move back there and help out with the family business that my family has had since the 1920s – North Star Hardware and Implements – which is a farm equipment dealership. Probably coach some Little League and high school baseball too. Nothing big but I’ve got to pass on all this knowledge that I learned some how. Coaching is something I’m passionate about. I can’t keep all this stuff inside. Somebody else has got to benefit from it. I’ve learned and experienced and tried to gain as much knowledge as I can and the only advantage of gaining all that is to pass it on to somebody else and hopefully they get to live out the life I have been able to live out. Your first Major League win was against the Yankees. Not many people can say that, so what was that like? It was the first year of the new Yankee Stadium. I remember calling home and saying I was pitching in Yankee Stadium so you got to come watch me. My dad made the trip and a few of my cousins made the trip and it was the kind of weather like we had today. It was a 1 o’clock game and we didn’t play until 6 o’clock on a Sunday. It was a cool game and we ended up shutting them out. I pitched 6 innings, 6 1/3 I think it was, and I got the win and got the pie in the face and all that stuff, so it was a good memory I have of pitching in Yankee Stadium and I haven’t been back since. But they went onto win the World Series that year. A pretty good team that year. A lot of Hall of Famers on that team so a feather in my cap. Any particular fond memories from that game or other moments in your career so far? I think probably the biggest memory of that game is I struck out Alex Rodriguez in the first inning. He is a high profile layer for a kid from small town Ohio to strike out one of the greatest players of all time in Yankee Stadium is something I won’t forget. I’m sure he has already forgotten about it, but it is something I will remember. There are a lot of other memories too. Playing in the playoffs in probably the most memorable. Winning the division with the Nationals in 2012 and 2014. Those teams accomplishments knowing we put in the work and a lot of those guys I played with we came up through the minor leagues together so we share a lot of memories even from the bus rides and all that jazz and have the same memories in the big leagues. We fell a little bit short in those playoff runs but they are nonetheless still really good memories of a lot of success. What is being a professional baseball player like? A lot of it is still remembering that 10-year-old boy that used to play baseball and being able to go out on that field every single day and feel that same way is a pretty neat feeling and that is the best way I can describe it.I think we all still have that feeling. We get in these ruts of success and failure, but when we all remember why we started playing the game when we were little it makes the game a whole lot easier and a whole lot more fun. What kind of goals do you have going forward? I think every players get to this point in their career and they want to win a World Series and that is kind of my goal. Whatever it is going to take. If I am just a bystander or if I am one of the main guys in the bullpen I am going to try to help the San Diego Padres win the World Series. However long that takes I am willing to put in the effort and we will see how long my career lasts but I know every day is special and I am lucky to be here every day. Talk about the transition of being a starter and then going to the bullpen? When I was young I was a starter and I came up through the minor league as a starter and thought that was going to be my ticket. I ended up not being as successful as a starter and with the Nationals having guys like Stephen Strasburg and Jordan Zimmerman and Max Scherzer starting was probably not where I was going to be so they gave me an opportunity to be in the bullpen. Jim Riggleman was the first one to move me to the bullpen. He made that move and it has been a good move and a great opportunity for my career. It probably allowed me to play in the big leagues a lot longer than I would have if stayed as a starter. I’ve had some success and I continue to try and keep that success going. This entry was tagged Craig Stammen, MLB, North Star, Ohio, San Diego Padres, University of Dayton, Versailles High School. Bookmark the permalink.